1963 Menu from US Forces in Thailand, Christmas Dinner, Turkey, Cornbread dressing, ham, potatoes, sweet potatoes & more. Nice menu. Has a little bit of use and a little bit of discoloration, but still excellent!! 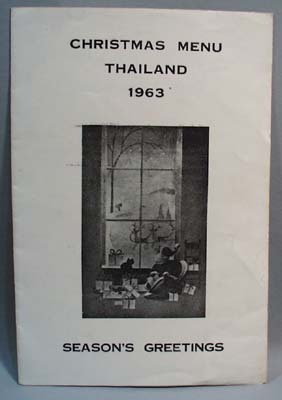 4 pages, 6 1/2 x 9 1/2"
Items Similar To "1963 Menu US Forces in Thailand Christmas"